A dry partition wall is very convenient, since it can be both built and removed with equal ease. Dry partition walls can serve a number of purposes such as separating space for your child’s room or for a home office. Before you start however, make sure you have all the required equipment and materials at your disposal. Determine the position where you would want to build the dry partition wall and mark the position with a marker or a chalk on the floor. Use a chalk line to ensure that you mark the floor along a straight line. You would have to fit the partitioning studs into a track laid across the floor. After you have laid out the bottom track, use screws or an adhesive to secure it to the floor. Now you need to mark the exact position of the top track which will run across the ceiling. To accomplish this, place the end support into the bottom track. Hold the end support in a straight, vertical position using a carpenter’s level and mark the position of the top track on the ceiling accordingly. Use the marks that you made on the ceiling in the previous step as a reference to attach the ceiling track. 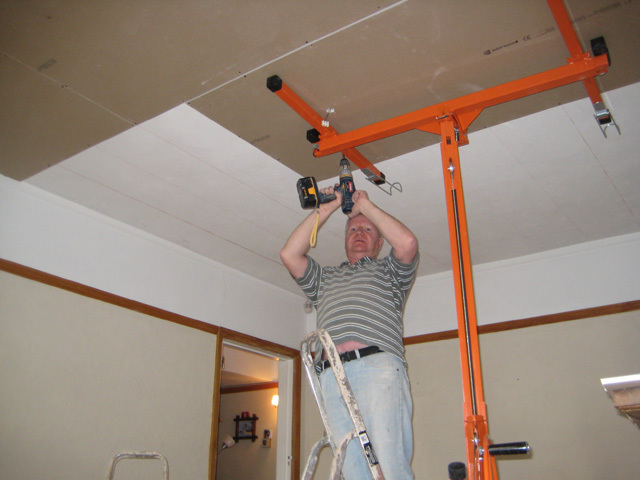 Use screws or adhesive to secure the track on the ceiling. Depending on the total height of the wall, install metal studs into both bottom and top tracks in a vertical position. However, the first metal stud you install has to be along with the wall to which the partition is being added. Since metal studs expand or contract in length due to climatic changes, be sure to cut the studs approximately ¼ inch shorter than the required length which is the total distance between the floor and ceiling. Determine the type of sheeting material you will be using for the partition. It can either be wallboard, paneling, glass or any other sheeting material of your choice. Attach the sheeting to one side of the wall and hold it in place with screws or an adhesive. Be sure to leave at least a ½ inch gap between the sheeting, ceiling and the floor. This will allow enough space for the wall to expand or contract due to climatic changes. If you want the wall to be soundproof, simply add insulation inside the wall. Extend out electrical wires or plumbing from both ends of the wall if required. On the other side of the dry partition wall, put up a material of your choice. Be sure to secure the material you put up using screws or an adhesive. Paint the outside surface of the wall if required. If you do not want to paint the wall, you can use a wallpaper for finishing.